One of the best way to understand the sporting equipment we use is to know their origin and how they became part of the game. It is imperative to know this as it helps shape our understanding of the game better and why some of these things are necessary in the game. That is also the case of an ankle soccer brace. A good example is when two young kids are playing some kids soccer at the back of your house and not on a normal standard pitch, and one made a tackle on the other that left him with a bruise, it might be seen as a bad tackle but in most cases, it’s not. It is the absence of guards like ankle soccer brace that might cause such. The ankle soccer brace might not completely be able to eradicate the impact of a tackle but will definitely reduce it to the barest minimum. The good news is that there are very affordable ankle soccer brace in the market that everyone could find one okay by his pocket. Looking back at the history of the game, it will now be clear why careers of players end so quickly back then because it wasn’t in existence for at least the first 20 years of soccer. It was fear and concern in another sport, cricket that made its discovery something every sport now embrace. It would be an invention that would change the rules of cricket in 1809. Back in the Middle Ages, the commonest form of protection worn by players is the greave which serve the purpose of protecting the shin and the history of shin guard date for back as the history of the bible when David and Goliath fought and Goliath was describe to have worn bronze leggings. This is something close to the design of the shin guard. So the use of protective have always been something of old just that technology made it better now and gives room for different types of protective that serve similar roles, yet all used during a soccer match. How Did Soccer End Up Getting Shin Guards? The use of protective first came into reality in England when a cricketer for Nottinghamshire who happened to also play for Nottingham Forest was seen using it after he had several kicks while playing soccer. This was in 1894. So many credit the use of shin guards and protective generally to this player, Sam Weller Widdowson. What he did was protecting himself by cutting down a set of cricket shin pads. He then strapped them to the outside of his soccer socks by using leather straps. This was obviously not first accepted by many in game as it was called crazy because it was a new idea but as time goes on and many see it working for the purpose he used it for, it was not long before it became something of general acceptance. Technology advancement have made us move from the old protective and we now have several new ones. There are two basic types of shin guards that are available for players today. The Slip-in shin guards that go underneath the soccer socks and the ankle shin guards that extend protection around the foot also called the ankle soccer brace. These designs are made to best suits the position a player plays on the pitch. The kind of brace a defender use is different from the one an attacker use. Due to the fact defenders have most work to do stopping an attack or blocking a shot, they typically wear extra ankle protection and may have guards that stretch from the ankle to nearly the knee. Midfielders wear smaller shin guards that still have a bit of weight to them, but are also lightweight so that movements aren’t impeded. The strikers wear the lightest of the shin guards because they make lot of runs and they will want something that will not add to their weight, so the need for something very light. They often wear similar ones to the midfielders whenever they have to defend in the game especially when the coach tactics was set up to defend more than attack. Goalkeepers also do wear shin guards but not always and not a necessity but just something of preference. A standard shin guard shove cover most of the area from the ankle to the knee, though some soccer shin guards may only come up about 75% of the way. You can determine the size of your shin guard by measuring from right above your shoe top to the area of your knee just below where it bends. The type of shin guard suitable to each player can also be determined by the manufacturer you are buying from. Some are categorized by age while others by measurement. What is important is that one pick a guard that best fits his leg and of same size for ease when using it. There is however a new trend where players decide not to use guards. This is in leagues that is not made compulsory. In most leagues now, it’s mandatory for all players to use, no matter how small it may be. So when the league or competition does not require it, they play without it. The reason some make for this is that there is a better and freer movement when playing without a guard. The ease in movement is what so many attacking and fast players are willing to let go of their guards. Why Do Some Soccer Players Decide Not to Use Shin Guards? In many soccer leagues, shin guards are a required part of the uniform. When that happens, you may see some players trying to wear the smallest shin guard possible. And, if the league doesn’t require shin guards, then you will find that some may prefer to go without. 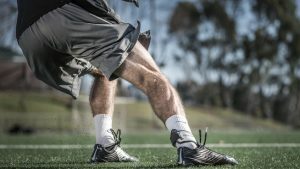 For players that tend to drive forward often, most injuries tend to come on the back of the leg on the calf muscle instead, so shin guards aren’t always seen as helpful either. It has gotten to the point where some even see it as a ceremonial piece in the sport and not a necessity. It is still however a very relevant equipment for others. We however can be sure of one thing, the advantage of its use trumps the disadvantage. No matter how much hindrance it may cause in the movement of player or control of the ball, which will never match that of the injury that may occur when it is not use. Many careers can come to an end just because it’s not worn.